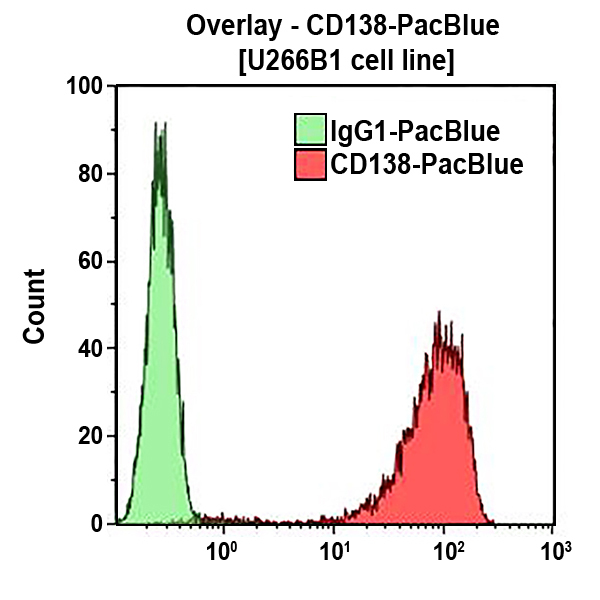 The CD138 antigen (also known as syndecan-1) is a member of the syndecan family, which is comprised of 4 types of transmembrane heparan sulfate proteoglycans macromolecules (syndecan-1, -2 or fibroglycan, -3 or N-syndecan, and -4 or amphiglycan). Syndecan molecules are involved in interactions with extracellular matrix proteins, with cell-surface molecules and with soluble proteins such as cytokines. Most adherent mammalian cells are reported to express heparan sulfate proteoglycans (including syndecan-1) and the expression seems to be developmentally regulated. *Alexa Fluor and Pacific Blue are registered trademarks of Molecular Probes, Inc.